Fibroids can cause fertility problems but most fibroids do not cause any issues getting pregnancy and the women that have them can get pregnant and deliver a healthy baby. But if you are wondering “Can I get pregnant with fibroids?” it is important to note that the National Institutes of Health has stated that uterine fibroids can cause infertility in some women. However, it is important to note that the link between fibroids and infertility can be very subtle and complicated which we will look into below. Can I get pregnant with fibroids? Some types of fibroids can lead to infertility which is based upon their location in the uterus. If the fibroid tumor is located within the endometrial cavity of the uterus, it can increase the risk of infertility and you may not be able to carry a child until this problem is resolved. Submucous or submucosal fibroids are usually located in this area. The walls of the uterus are lined with a tissue known as the endometrium which nourishes the fertilized egg until birth. If a fibroid tumor is growing in the endometrium, it can impact your ability to carry a child because this area will become hostile to a fertilized egg preventing it from attaching to the uterus. Submucosal fibroids are able to change the endometrium in such as way that it may become incapable of nourishing a fertilized egg until birth. Because instead of swelling and thickening in preparation for receiving a fertilized egg, this lining may become a smooth, cold and hard wall which is not ideal for a fertilized egg. Some studies have also shown that having submucosal uterine fibroids can decrease fertility by as much as 70 percent. In order to increase fertility, these fibroids will need to be removed first. Some fibroids can release certain chemicals which are known as prostaglandins which represent pain causing hormones. When these hormones are released by the tumors, it can also lead to contractions of any smooth muscle tissue in the surrounding areas which can further turn the uterus into a hostile environment for a fertilized egg. This is also related to the type or location of fibroid tumors. 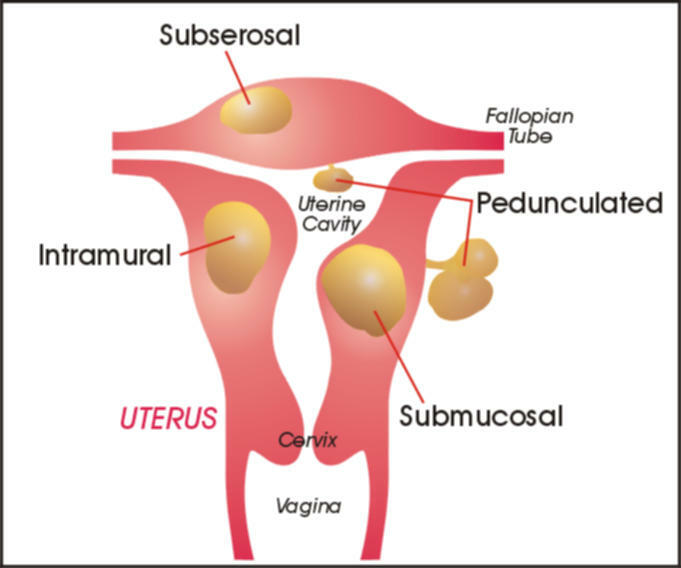 Intramural and subserosal fibroid tumors are located close to the fallopian tubes. Fallopian tubes are responsible for releasing an egg to be fertilized each month in women of childbearing age. While these tumors that are located close to the fallopian tubes may not affect fertility in many cases, in other cases, these tumors can block or compress the fallopian tubes making it impossible for the egg to be released or reach the uterus. This situation can also be dangerous if the egg is fertilized in the fallopian tubes but because of the blockage, it can make it impossible for the egg to reach the uterus and grow leading this fertilized egg to grow in the fallopian tubes where it is not meant to grow. This is dangerous and is known as an ectopic pregnancy. The type of tumors that may not affect fertility are pedunculated fibroids which are attached to the uterus by a narrow stem or stalk and usually are not close to the fallopian tubes or the lining of the uterus. While subserosal fibroid tumors have been noted above to be able to impact fertility (when they are close to and end up blocking or compressing the fallopian tubes), when they grow beneath the uterus’ outer covering, they will not affect fertility in most cases. Fibroids may also cause many other issues with fertility than those described above if you are asking “can I get pregnant with fibroids? Not only can they lead to infertility but even when you do manage to get pregnant, other issues may result during the pregnancy and during delivery due to fibroids. You can read more about these pregnancy and delivery issues at The 411 On Uterine Fibroids And Pregnancy. “Can I get pregnant with fibroids?” You certainly can as many women have discovered but why would you want to especially if you not only want to conceive but have a healthy pregnancy and delivery because fibroids can cause minor or significant issues in all these areas. The best way if you have fibroids is to remove them and prevent them from returning before you attempt to get pregnant. The only way to do this is holistically and the step by step methods in the Fibroids Miracle guide can help you not only get rid of fibroids but also prevent them from returning.